We’re pleased to welcome Brian Hahn to the AdaptiBar Blog. Brian is the founder of Make This Your Last Time and a second-time passer of the California Bar Exam, who is here today to share five counterintuitive ideas when it comes to effectively studying for the MBE. Ah yes, everyone’s favorite section of the bar exam. Up to half of your score depends on a series of letters (I’m not talking about essays, which are also a series of letters… never mind). By the end, it pretty much feels like “multiple guess”. Welcome to the Multistate Bar Exam (MBE). Whether you’re new to the MBE or not, you’re in for a ride. That said, it’s your life and your bar exam. I can give you all the tools and guidance you want, but it’s up to you to decide whether they make sense to you and to implement them. I knew how to state the definition of the term “alleged” for my vocabulary test in 5th grade, but I had no idea what it really meant or how to use it in a sentence. Knowing rules (in theory) is vastly different from knowing how to exploit those rules. It can be a bit counterintuitive that information (and education in general) alone isn’t enough. We all like “learning”; that’s the fun part. (You probably know someone who’s a perpetual student getting yet another degree and living off loans.) As lawyers, we’re professional learners who absorb new information and make use of it to get the results we want. It’s great that you’re memorizing the rules. So is everyone else. It’s table stakes, just a cost of entry. So what’s the difference between high scorers and low scorers? Can you RECALL the rule, given some facts? There’s a distinction between memorizing and being able to remember it on your own. Do you understand the rule enough to apply it to the block of facts? Each of these is a micro-skill in itself. Don’t worry if it sounds complicated. You’ll learn by doing. You eventually figure out how to use a new word in the right context. Knowledge isn’t only meant to be learned; it’s meant to be applied. Don’t let it expire. Use it to learn it. We can talk all day about rules, issues, which part of the question to read first, etc. That’s all well and good, but what it really comes down to is whether you can pick the right answer to the call of the question. Surprising truth #1: While memorizing rules is necessary, you’ll see a greater score improvement through the process of struggling to answer questions and revising your approach. In other words, to be able to solve MBE problems later, solve MBE problems now. OK, so you’re ready to work through some MBE questions. Seems simple enough. But every year, there seems to be a contest over who can do the most number of practice questions. If you have the bandwidth to do thousands of questions, that’s great… as long as you’re learning something from each of them. Each question is an opportunity for a LESSON or a VALIDATION. If you (happen to) get a question right, you feel like a full-on genius. You don’t want to kill the buzz and relief by reading the explanation. “I know this already,” you tell yourself the magic words while living within the illusion of certainty. You got it right in the end, so what’s the point? You’re too busy! You have other questions to do! Well, just because you’re correct doesn’t mean you’re right. You want to know that you got it right for the right reason. Each question is an opportunity to validate your understanding (if you chose the credited answer) or to learn the legal principle and how it’s applied (if you were wrong). The learning happens not when you do the questions. Rather, it happens when you review your work and get feedback from the answer explanations—in their entirety, for each choice for each question you get wrong and right. Surprising truth #2: It’s more about the QUALITY of learning than the QUANTITY of questions you do. If you can get both, great. Fill in the company of your choice. All the “big box” heavyweight players have names that are 6 letters long. Very interesting. What if I told you to go back to your 1L Contracts final to prepare for the essay portion of the bar exam? It’s OK to question me if you disagree! Say it: “Are you sure about that, Brian?” “You’re out of your mind!” Or some other words that actually need to be censored. Essays from law school are hours long. They’re not a fair representation of essays on the bar which are designed to be answered in 30 to 60 minutes (depending on your state). So why would you use questions that aren’t even designed by the same people who write the real MBE questions? That’s a trick question and also a rhetorical question. You can breathe a sigh of relief because there are still uses for questions you paid thousands for (AKA TOO MUCH). If reading that stings your soul, good, pay attention. Prep companies say that you should use their questions, even if those questions may have a different style and feel. Their logic is that the questions you’ll see on the actual MBE will be easier in comparison to the excessively complicated questions (and “add 15 points to adjust for difficulty” in the meantime). I don’t believe this is the right kind of “stress testing.” Those questions are not hard for the right reasons. Sometimes the manufactured questions are too easy. Sometimes the right answer choice isn’t clear or explanations are incorrect. When you’re in panic mode during the bar exam, everything flies out the window. Even if you think the questions you see on the bar seem “easier” than the artificially difficult questions you practiced with, you still won’t be completely familiar with the “real” style of questions. They may feel slightly “off,” and you may end up confused and second-guessing. If you want to make your training harder or give yourself a buffer, try to answer each question in something like 1.5 minutes for each real question (instead of the allotted 1.8). That said, the MBE is getting harder and less predictable (the day Mark Zuckerberg gets a humanity update patch, we’re all doomed). The trend is that scores are going down, and questions are longer and trickier. You could do, say, 25% of your questions from your prep course and 75% from a source of past MBE questions. 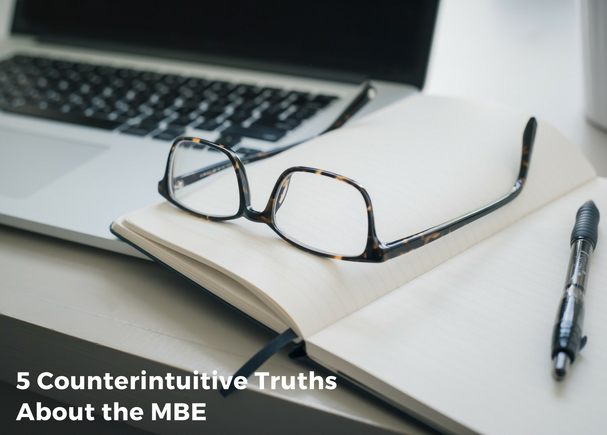 Surprising truth #3: Even though questions written by bar courses aren’t completely reflective of the questions you’ll see on the actual MBE, this doesn’t mean they’re useless. Although you want to use what you’ll see on the actual exam in practice, you can diversify real questions with “fake” questions. You’ve heard rumors of the NCBE’s Online Practice Exams (OPEs) containing MBE questions from the past, and the new Study Aid that comes with 30 past Civ Pro questions. You’re thinking of going directly to the source of real questions. The Study Aid can help if you’re looking to see what the newer questions are like, but it doesn’t include annotations (explanations). If you’re looking to see what the NCBE’s own reasoning process is like, annotations in the OPEs can help. As noted above, it’s a good idea to look at actual MBE questions. And definitely, use the resources that match your needs. Just keep in mind that if you purchase the Study Aid and all the OPEs (610 questions total from the NCBE), it would cost $285. Depending on what you get, the bill can start racking up… But it’s possible to reduce the number of supplements you use while increasing the value you get. There are resources that give you access to questions that you can’t simply download from the NCBE. Some factors to consider: cost, number of questions, learning value, analytics, online vs. paper. See here for a comparison of a bunch of MBE question sources. You decide which is worth it for you. Surprising truth #4: While the NCBE offers tools that can fill a specific need, there are other more cost-effective options that consolidate MBE questions for you. It seems like everyone merely tracks their overall MBE percentage score, which is fine per se. But it’s entirely possible that you’re awesome in one subject yet not so much in another, and your overall percentage doesn’t reveal this! For example, at one point, I was getting a 73% average score in crim topics. Just by looking at that, you wouldn’t have suspected that I was getting 80%+ on Criminal Law questions (90%+ in the category of common-law crimes) but 40% on Criminal Procedure. Why not go after the topics that are easily fixable? Nothing is worse than knowing that you could be making mistakes that could easily be fixed with feedback. Don’t let the bar be the feedback. You could also keep track of “win rates” for subtopics, such as negligence, crimes, hearsay, etc. When parsed out like above, I could pinpoint the exact cracks in the pipe, the areas I needed to study more carefully. This is also an opportunity to make use of manufactured questions by drilling your weak subjects with them. You know, in case you don’t want to feel like you’re wasting your limited supply of authentic questions (see #3 above). Surprising truth #5: There’s a distinction between watching your aggregate score and a portfolio of scores. The latter kind of analytics creates useful data to surgically treat your weaknesses, which will, in turn, improve your overall score anyway. Which of these got you thinking? What are you going to change in your approach when preparing for the MBE? Drop a comment below. I’d love to hear. As a second-time passer of the California Bar Exam who’s helped hundreds of students all over the country prepare for the bar exam, Brian knows what works and what doesn’t work. Check out Make This Your Last Time for more candid and approachable discussions on bar prep and loads of resources to help you leave the bar behind you forever.